We are now offering the X10 Martin Audio Blackline X10 Speakers for hire. 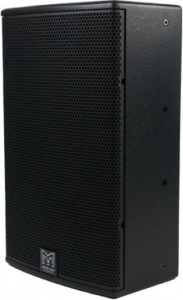 The X10 is a high performance yet very compact two-way passive loudspeaker system which utilises a 10” (250mm)/2.5” (63mm) voice coil LF driver and a 1” (25mm) exit HF compression driver with a 1.4” (35mm) polyimide diaphragm. The rotatable 90° x 50° HF horn has equal horizontal and vertical mouth dimensions for directivity control in both planes.